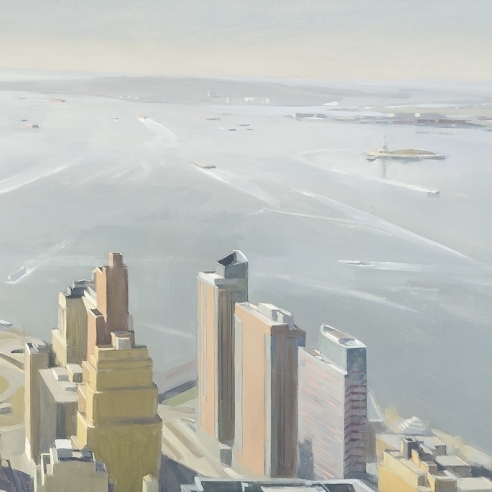 Diana Horowitz painted World Trade Center Reflecting Pools and Harbor #1 during her tenure as a guest artist on the 48th floor of the re-built 7 World Trade Center. When 7 World Trade Center was erected in 2006, developer Larry Silverstein invited Horowitz to use its 48th floor as a unique studio space. 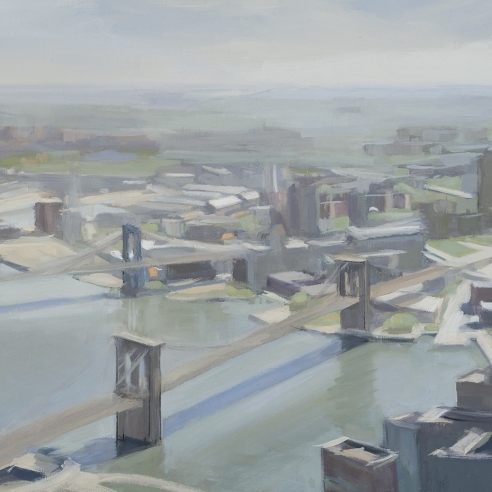 However, it was not the first time Horowitz had painted from the World Trade Center. 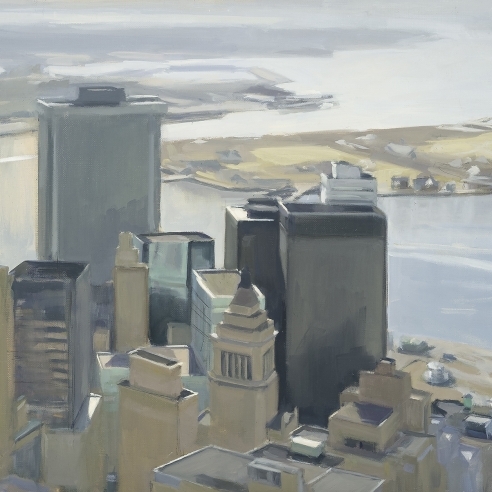 She first began painting from the 107th Floor of Tower 2 in the mid-1980s and spent nearly fifteen years creating her panoramic city views of lower Manhattan from its soaring heights. Horowitz’s post 9-11 return to the site presented new opportunities and new challenges. Below her, the Memorial Pools, World Trade One, and the Freedom Tower were taking shape and lower Manhattan was reawakening. The new construction and the ever-changing cityscape provided subject matter that was not only profound, but rich with formal potential. The formal components of the city and its architecture intrigue Horowitz perhaps more than anything else. For, while a realist in some ways, she is also an abstract artist inspired by shapes, geometry and color. 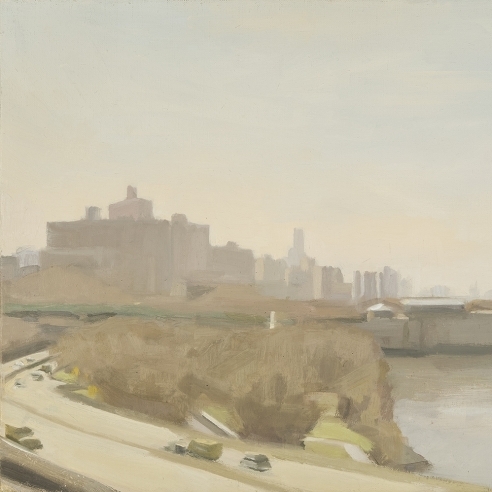 The high vantage point of her World Trade Center studio enabled her to examine the abstract forms inherent in the skyline more than she ever could have from the ground. Horowitz paints en plein air and often carries her small canvases around with her, as she chases the light that is so critical to her work. 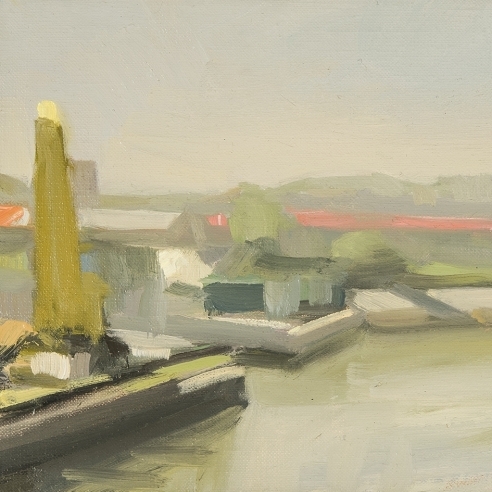 The effects she captures—reflections gleaming off the river’s surface, the sun’s rays filtering through the morning fog, or a dark shadow obscuring the side of a building—are subtle, but lead to the creation of paintings that are nuanced and carefully balanced. 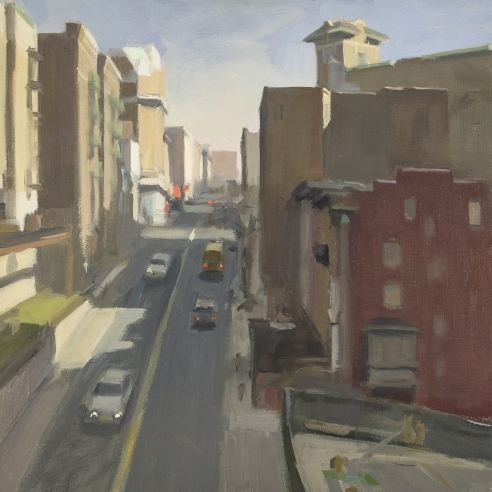 Born in New York in 1958, Diana Horowitz received her MFA from Brooklyn College and completed graduate studies at the Tyler School of Art Program in Rome. She has received numerous grants and awards, including those from the Ballinglen Foundation, the Lower Manhattan Cultural Council, the Pollock-Krasner Foundation, and the Ingram Merrill Foundation. In 2005 she was elected a member of the National Academy of Design, New York. 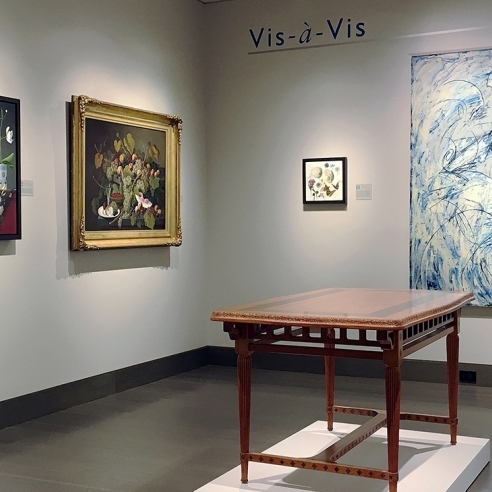 Horowitz’s work is found in numerous private and public collections, and has been widely exhibited in San Francisco, Houston, Chicago, Boston, and New York.